The cornerstone of good design is its longevity. Every designer wants to create that timeless piece which seems to last for eternity (Think Ray and Charles Eames). If this does indeed happen to a design(er) it may a problem in that it can compel said designer to become complacent and rest on their laurels. Of course such a crazy notion is never considered at IDS as we are always trying to learn from our past work and find new and exciting ways to implement our knowledge to future projects. A recent project that made its way through our studio was a refresh of a space we had previously designed in 2010. That project being A Kinney Court which houses Garrett Leight California Optical. The building itself was coming under renovation so a desire to update the furniture and displays was expressed and we jumped at the chance to try and outdo ourselves. It is extremely rare to get the opportunity to redesign a space you did 5 years prior, especially if the past design was considered to be strong both visually as well as functionally. So we had the arduous tasks of trying to exceed our previous design intentions with a new and fresh language. We looked at this project as an opportunity to explore both our mold making and casting abilities as well as a great exploration in pattern generation. Ultimately we wanted to create a modular system that could be easily adaptable and used a subtle pattern which could be used not to overwhelm the products being sold but rather add an accent and character to them. The goal in the studio, when it comes to display design, is never to over shine the products being sold but rather enhance and compliment them. The end result of this thinking in the case of AK court was a series of cast fiber reinforced concrete (FRC) panels, with 3 varying heights, that were augmented with a subtle triangular pattern lot draw the viewer's attention without overwhelming the product on display. In terms of fabricating the panels, a master urethane rubber mold was cast in our shop with stand offs to indicate the location of the shelves for the 3 different height concrete panels. From this urethane mold the concrete panels were cast with the hardware for the shelf brackets embedded for each respected height. The ingenuity of the mold itself was the fact that from one casting and a series of dams, we were able to cast panels of 3 different heights using a single mold. Another little detail that may be overlooked by some was the actual texture inherent within the rubber mold. When generating the master plug in which the mold would cast we noticed a texture generated by our CNC mill in the wood. Rather than sand the plug smooth or rerun the file on the machine to smooth the surface, we decided to keep the texture and pay homage to the language of digital fabrication within the whole process. A happy little easter egg for those always looking for hidden details. It's a nice little challenge to reimagine a space or product you designed in the past. It presents an opportunity to implement your accumulated knowledge and growth. Looking at, and rejuvenating a past design with a fresh pair of eyes will almost always enhance the outcome. If you have the opportunity I highly recommend it. Recently IDS was approached to design a building-scale public art project in Pasadena. The project is an exciting addition to the usual studio workload, and a great chance to alter the landscape of our city. Our aim for this project is to make commentary on the experience of time on three different scales: the order of seconds, the order of hours, and the order of months. To express these scales, we created three separate elements that will display the passage of time. First, an array of fins across the first floor creates a rhythmic pattern that mimics the regular, observable advance of seconds. Some fins extend are painted yellow and vertically to tie into the second element: the sundial. As the sun advances along its course, it uses the building façade itself to indicate the afternoon hours. As the sun sets, the third timekeeping element comes to life: a moondial indicates the current phase of the moon. Timekeeping is a functional yet subtle aspect of our project. First and foremost, it is public art. We want the piece to have an immediate visual impact that both resonates with the viewer and enhances the quality of the architecture. 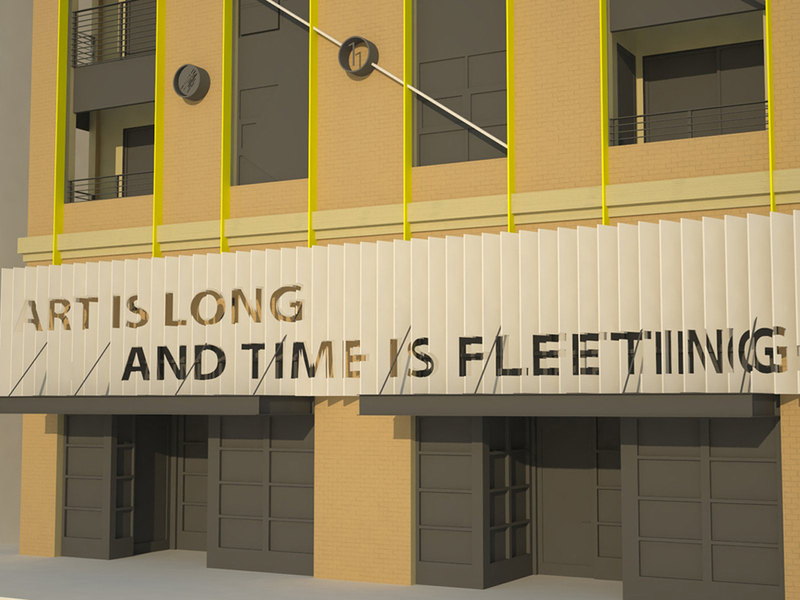 For the vertical elements of the sundial we chose a bright yellow to draw viewers’ eyes upwards, inviting them to study the installation and building together. The gnomon, which is the part of the sundial that casts the shadow, is painted red to set it apart from the neutral gray hour lines. These additions lend a unique element to the host building, setting it apart from its surroundings. As designers, we’re always striving to find new ways to influence the world around us. Needless to say, we’re thrilled to be working this project. We’ll keep updates coming as progress is made. 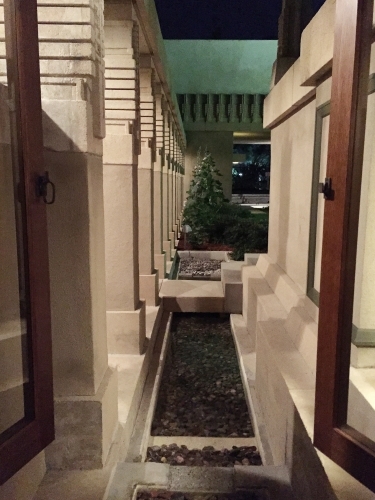 I recently had the opportunity to visit two significant pieces of architecture separated by more than 90 years of architectural development. 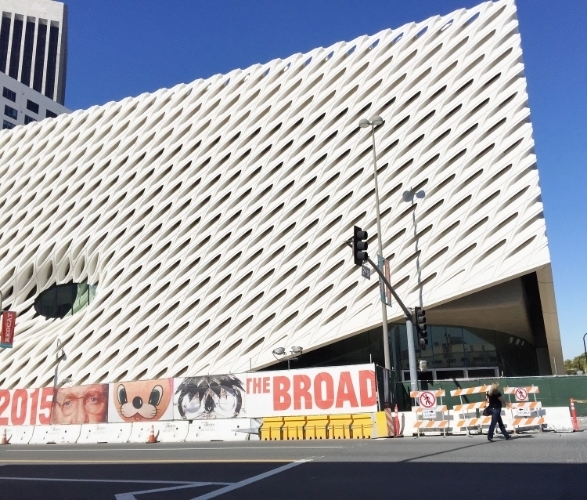 The first being the re-opening of the Hollyhock House by Frank Lloyd Wright in East Hollywood and the other being the Broad Museum by Diller Scofidio + Renfro located in Downtown Los Angeles. At their core, the buildings are surprisingly similar. Both are or were intended to house artwork and create a larger cultural impact than the respective structures themselves. Both use their materiality to create a shield to mask the intentions of the interior. In both cases, this is done with concrete which gives both structures a massive somewhat uninviting feeling as one approaches. You get a sense as you approach each project that something is happening inside but you can’t tell exactly what it is. If you are the inquisitive type, it then becomes your goal to find out exactly what that is and explore as much as you can - which of course is much more acceptable in the case of an art gallery or a museum compared to a private residence. Wright has used this tactic of confusing the spectator in many of his projects to protect the privacy of the buildings inhabitants. The idea being that the harder the building is to read from the exterior, the harder it is to understand the goings on happening on the interior. If you think of the art on display as being as temperamental as an individual seeking privacy, it seems to make sense in both cases to mask the activities inside. Both do use little moments to give a small glimpse into the interiors which of course can only be viewed from certain angles or location. Both designs are very clever in this way in that the Hollyhock uses this to hide the private life of the residence and shield them from the world whereas the Broad uses it to tease the spectator into coming inside and experiencing what the gallery has to offer. Even the location of the buildings adds to this notion of hiding themselves. Albeit in somewhat different circumstances. The Hollyhock nestles itself on a hill in Hollywood surrounded by nature whereas the Broad perches itself on a hill in the heart of downtown and surrounds itself with design somewhat becoming lost within the forest of new architecture that is finding its way to the new downtown. When one enters both of the spaces, the similarities begin to fall away quite rapidly. The language of the 2 buildings is vastly different. The Hollyhock can be considered a complete piece of design. Each detail, fixture, piece of furniture has been carefully planned and laid out to achieve an overall harmony and atmosphere throughout the house. The Broad uses the modern take on detail and attempts to fade them together to create a larger whole rather than letting them speak for themselves in a larger narrative. In doing so there seems to be a disconnect in some places and the reading of the building becomes a bit jagged. Now granted this is not the intention of the Broad. Being a museum and a gallery space, the goal is for the building as to not distract from the more “interesting” works on display. It appears the space with achieve this goal quite well. The entire space was lit using natural light with absolutely no shadows cast. 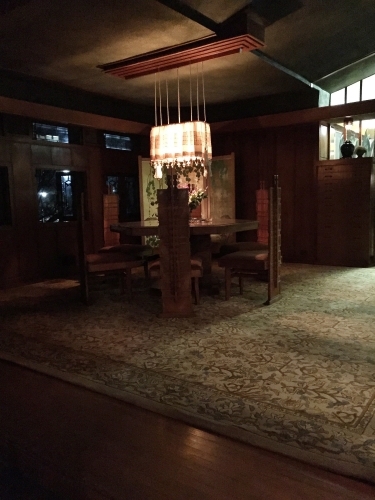 The engineering and design of the lighting within the space was incredible. It is a shame however, that the space will not remain in its open state but rather be filled with partitions to divide the space. One little nod that was similar within the interiors was the use of narrow low spaces to open into a vast large space. 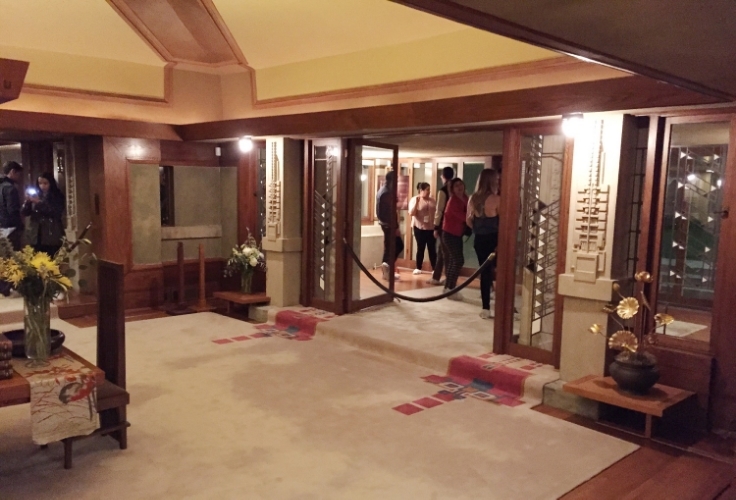 This is of course a trademark of Frank Lloyd Wright to use a low narrow corridor to open into the vast living spaces with the residence. 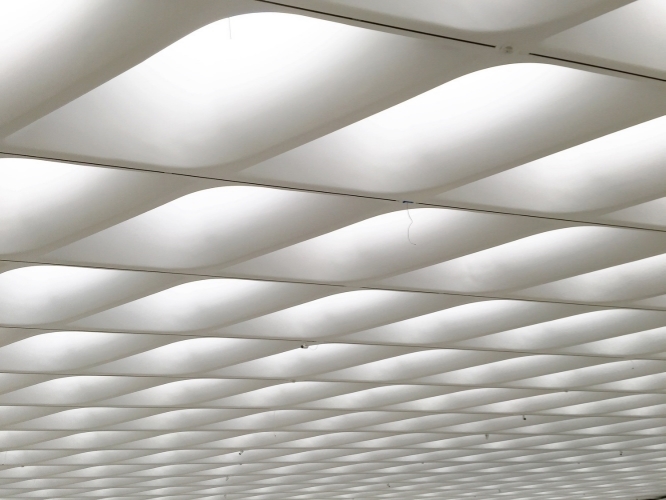 It was a nice little to detail to see within the Broad in that to enter the gallery space you have the option of traveling on the narrow escalator in a low corridor and arrive in the vast open gallery space. Just nice to know that some tricks will never grow old. Overall, it was extremely interesting to visit both of these sites within a matter of days. It is one of the things that amazes me about architecture. Here we have two seemingly different projects that on their own have a character and a presence yet are also part of a greater whole that makes up the extremely diverse nature of the city. It helps to highlight the growth of larger metropolitan area that must occur naturally, in terms of architecture and design, to create a greater harmony within a city as large as Los Angeles. Welcome to Ilan Dei Studio's new blog! We're excited to begin to share with you our work, thoughts, and processes on sensory and experience design, branding, and fabrication through our new blog. Based in Venice, California for the past 25 years, we have embraced and cultivated the spirit of California's adaptive culture - experimenting with new ideas, accessing the melting pot of cultures from around the world, relishing in the natural world. 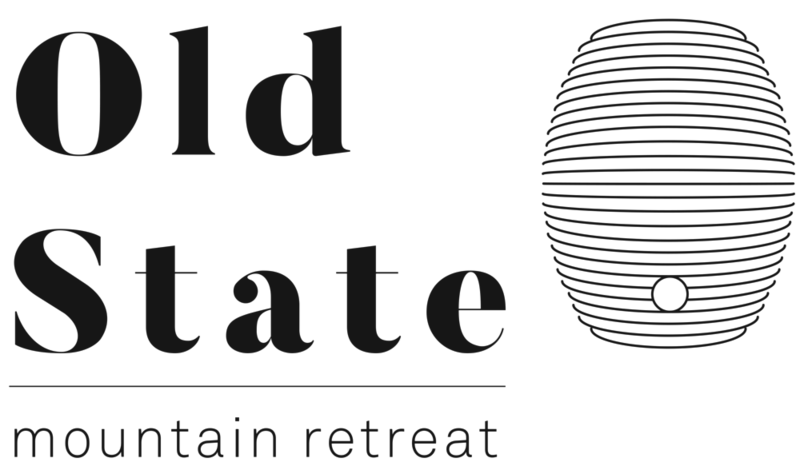 We are now harnessing that spirit to help some of the brightest emerging brands in retail, hospitality, and trade industries create memorable experiences and share their stories with the world in meaningful ways. We look forward to sharing our perspective on the world of sensory and experience design with you - stay tuned!